King - thanoscardgamess jimdo page! 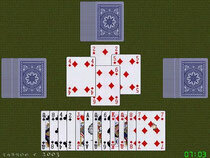 Combine your skills in Hearts and Spades to win. This is a trick taking game using a standard card deck. It is played in 10 hands. Each hand corresponds to a specific contract. There are negative contracts (e.g less tricks, less hearts, less queens etc.) and positive contracts (e.g most tricks with spades as trump suit). King is known in France, Belgium and Italy and is particularly popular in Portugal, Russia, Turkey, Colombia and Brazil. You have the option to play using either French or Portuguese rules. Version 2.1.1 addresses a bug that was occuring after the 'King' contract.